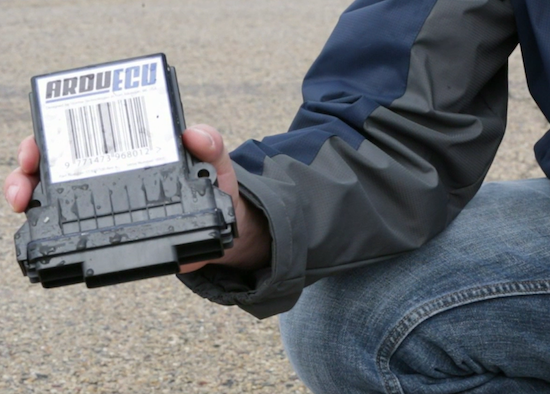 Now on Kickstarter, ArduECU is an IP69K-rated waterproof, rugged and impact-resistant electronic control unit (ECU) that enables your Arduino projects to withstand the elements and other harsh environments. ArduECU is compatible with all 12V to 24V systems, and can be used in a wide range of applications such as vehicle diagnostics and control, stationary machines, remote monitoring, industrial automation, and agriculture to name just a few. Based on an ATmega328, the ECU can be programmed with the Arduino IDE and also supports CoDeSys, meaning you can now configure your ArduECU with ladder logic, functional block, structured text, instruction list, or sequential function charts. 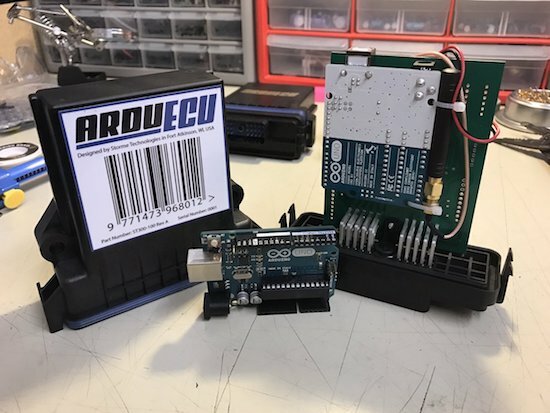 ArduECU comes in three models–one for basic projects, one for CAN bus vehicle and machine control applications, and another which converts an existing Arduino Uno into a weatherproof, custom-tailored ECU with an on-board prototyping area for your own creations and circuits. 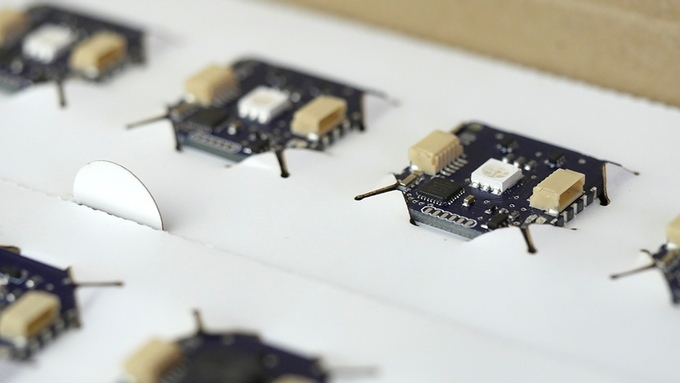 Each of these units will have expansion headers to leverage IoT and wireless capabilities, including Wi-Fi, Bluetooth, cellular and GPS, or to house future expansion shields with additional functionality at a later time. If you think building a walking robot is impossible, perhaps this little guy will change your mind! 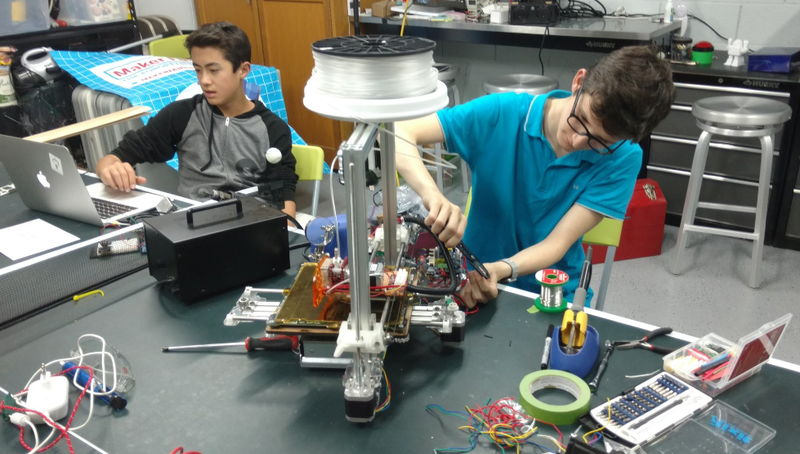 With platforms like the various flavors of Arduino, robotics has become accessible for many more people. Walking robots, however, can still be challenging. Especially when it comes to electronics and programming, one has some fairly complicated mechanisms to figure out. Perhaps none is more frustrating than four-legged walkers, as they seem very stable, but that all changes when one foot is removed from the ground. QuadBot aims to change this with an Arduino-compatible robot that, with clever cutouts for servo motors and plug-in headers on its main board, should be fairly easy to set up, yet capable of being expanded as needed. 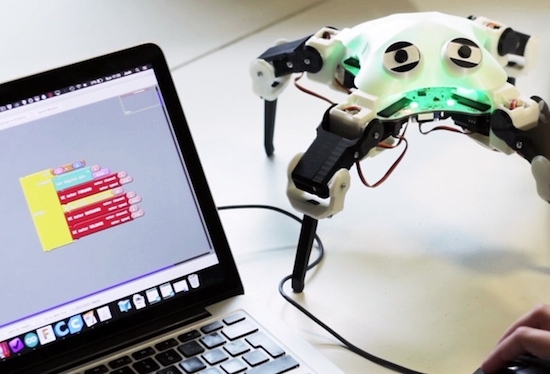 The 3D-printable, open-source bot is designed for Makers of any skill level. It works right out of the box and can be programmed using graphical blocks, ideal for beginners. Every aspect of QuadBot can be customized and modified, though, from the 3D design down to a single line of C++ code, opening it up to more advanced users as well. QuadBot doesn’t just walk either, it can dance, light up, and with sensors, can follow you, avoid obstacles, and even play songs. The project is the brainchild of Jack Scott-Reeve and Josh Elijah, who graduated with master’s degrees from the University of Manchester’s School of Electrical and Electronic Engineering. Interested? Head over to Scott-Reeve, Elijah and the team’s Kickstarter page to learn more or back QuadBot for yourself! Our good friends over at Primo Toys have just rolled out their Montessori-approved, Arduino AtHeart coding toy for children ages 3 and up. 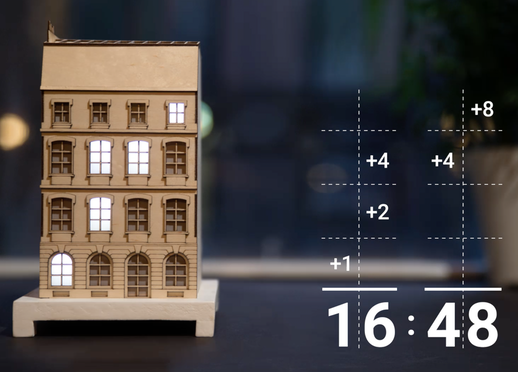 The Cubetto Playset, which you may remember from its incredibly successful Kickstarter campaign, is a screenless system powered by a revolutionary coding language made of colorful blocks that lets kids write their first computer programs. 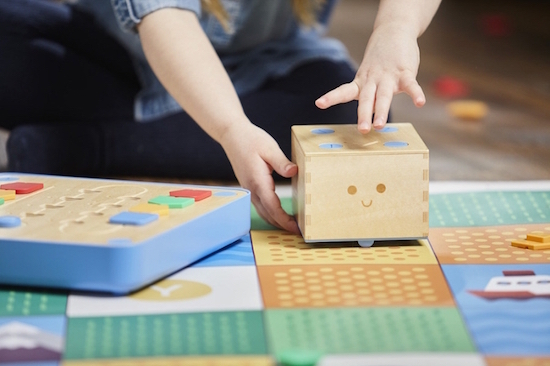 The playset consists of a friendly wooden robot named Cubetto, a physical programming console, a set of expandable coding blocks, a collection of illustrated maps, and an activity book. 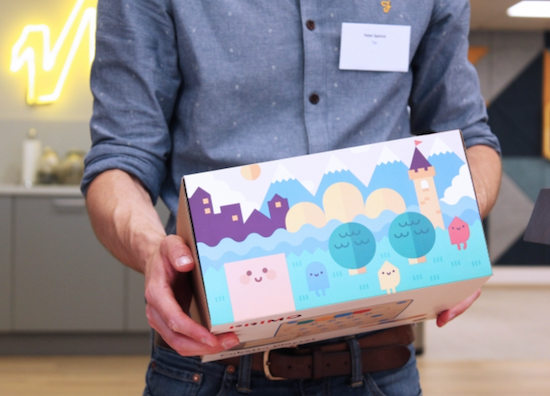 It’s the first programming toy of its kind to work without a digital interface or display, enabling children to explore the world of coding through storytelling, adventure and collaboration–even before they can read or write. 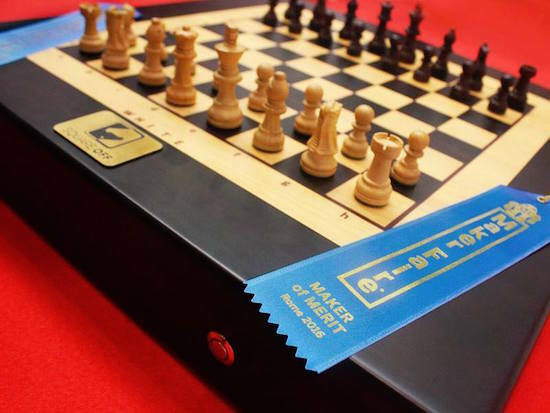 By placing the blocks in different patterns on the control panel, kids can create sequences of instructions that program the robot’s movement. In the process, they develop computational thinking skills that help them understand the basic principles of coding–all of this, in a very age-appropriate way that respects a child’s natural way of learning. 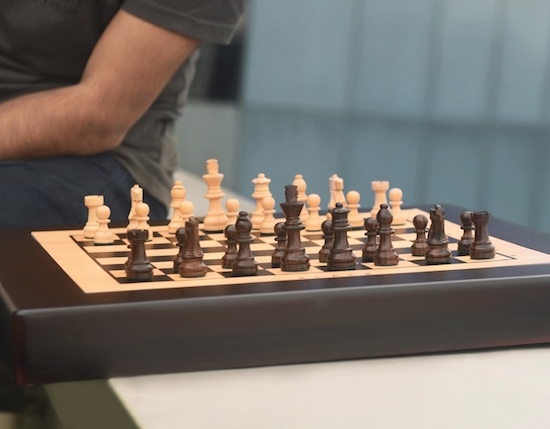 The London-based startup, which was founded by Filippo Yacob and Matteo Logli, is a graduate of the PCH Highway1 accelerator and has had the support of high-profile names including our very own Massimo Banzi and Randi Zuckerberg. Cubetto is now available for purchase on its website for $225, or $245 when bundled with the Cubetto Activity Pack, which offers four additional world maps and matching story books. Check it out here! For years, the open-source philosophy of Arduino has been the inspiration to robots, drones, medical and space research, interactive art, musical instruments, 3D printers, and so much more. 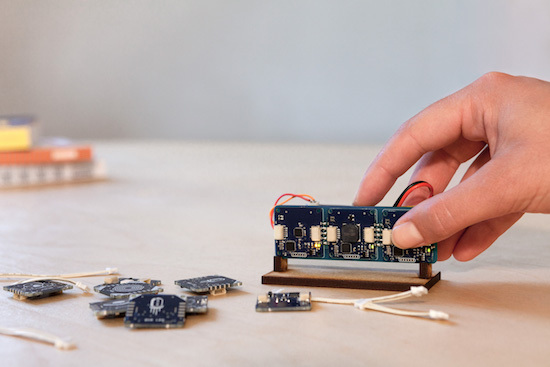 Now, Arduino is on a mission to radically simplify the way you build smart devices. 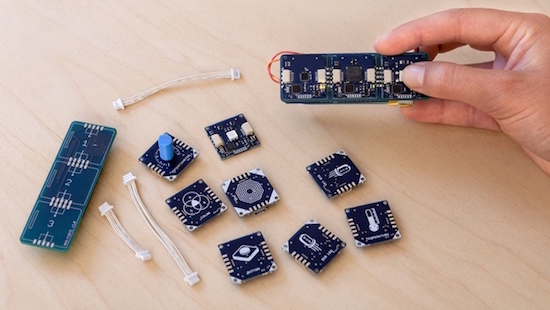 Introducing ESLOV, a revolutionary plug-and-play IoT invention kit. ESLOV consists of intelligent modules that join together to create projects in minutes with no prior hardware or programming knowledge necessary. Just connect the modules using cables or mounting them on the back of our WiFi and motion hub. When done, plug the hub into your PC. ESLOV’s visual code editor automatically recognizes each module, displaying them on your screen. Draw the connections between the modules on the editor, and watch your project come to life. From there, publish your device to the Arduino Cloud and interact with it remotely from anywhere (including your phone). The Arduino Cloud’s user-friendly interface simplifies complex interactions with sliders, buttons, value fields, and more. The ESLOV modules and hub can also be programmed with the wildly popular Arduino Editor — you can use either the online editor or the desktop-based IDE. With the provided libraries, you can customize the behavior of the existing modules, enhance the hub’s functionalities, as well as modify the protocols of both the hub and the modules. With a total of 25 modules — buttons, LEDs, air quality sensors, microphones, servos, and several others — the possibilities are endless. Sample applications include everything from a monitor that lets you know if your baby is safe, to a washing machine notifier that tells you when your laundry is finished, to a thermostat that you can adjust while out of the house. 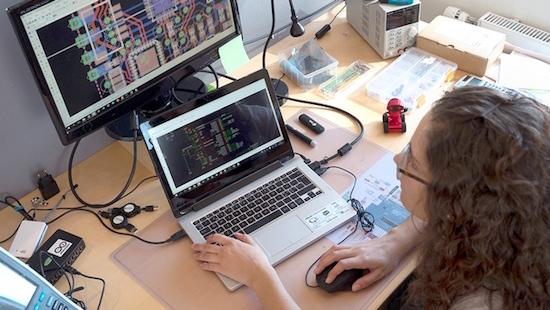 In line with the core values of the Arduino community, ESLOV’s hardware and software are open-source, enabling you to produce your own modules. Additionally, Arduino will welcome third-party modules from partners and other certified programs. 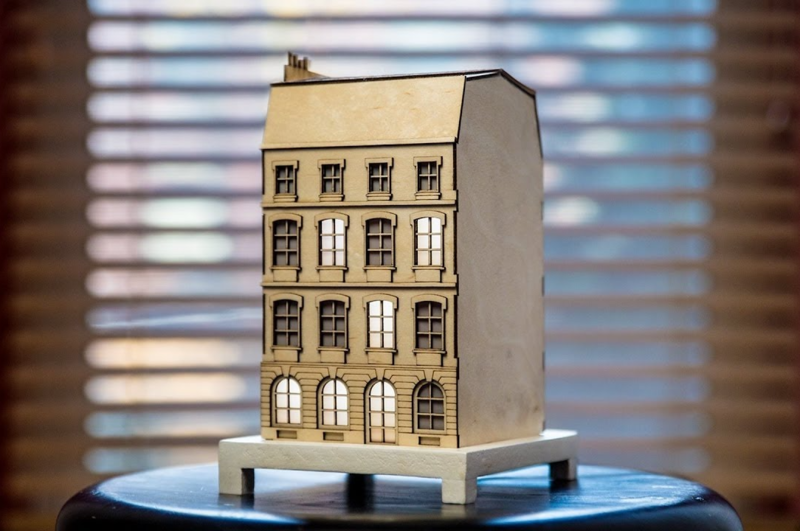 To accelerate its development in the open-source spirit, ESLOV — which began as part of a three-year EU-funded PELARS project — is now live on Kickstarter and needs your support. The toolkit is offered in a variety of sizes, depending on the number of modules. Prices range from ~$55 USD to ~$499 USD, with multipacks and other opportunities available as well. Delivery is expected to get underway in June 2017. In terms of hardware, the main hub is currently equipped with a Microchip SAM D21 ARM Cortex-M0+ MCU at 48MHz and built-in WiFi (just like the MKR1000). Each of the modules are small (2.5 x 2.5cm), low-power (3.3V), single-purpose boards featuring the same processor found at the heart of the Arduino/Genuino UNO: Microchip’s ATmega328P. The modules can be reprogrammed via I2C bus or with an external programmer. ESLOV’s hardware includes firmware from our factory, dedicated to the specific function of each module. The ESLOV connector has five pins (one more than standard I2C) for automatically configuring the module and handling the sleeping states to boost battery life. Tests can be performed on your computer via USB. The modules’ firmware and the hub’s software can be updated both using the USB cable and over-the-air (OTA). Those heading to World Maker Faire in New York on October 1st-2nd can learn more about the kit inside the Microchip booth in Zone 3, as well as during Massimo Banzi’s “State of Arduino” presentation on Saturday at 1:30pm in the New York Hall of Science Auditorium. Want to learn more or back ESLOV for yourself? Check out its Kickstarter page! Breaking bad habits can be difficult, but developing better ones isn’t so easy either. 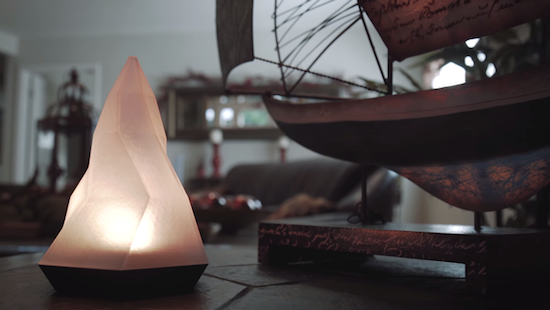 Mindful of this, former Project Ara founder Dan Makoski and David Khavari have come up with a smart, Arduino-friendly lamp that combines light, encouraging messages and a personal improvement algorithm to help you inch closer to your goal day by day. Connect Peak to your smartphone using its configuration app and set up a habit you’d like to master–whether that’s exercising, reading more, learning a new instrument, meditating, or spending quality time with loved ones. Simply touch the lamp and it will then send you a motivational text message. It recommends a step towards your target that you’ve either entered yourself or have chosen at Peak’s suggestion. You can schedule reminders if you need that extra little push as well. Once completed, touch it again or text Peak and it’ll record your progress, celebrating with a burst of light. What’s even cooler is the fact that Makoski and Khavari were fortunate enough to work with whiz kids (and our friends) Cesare Cacitti and Quin Etnyre. Peak was actually prototyped using the Arduino platform and currently runs on Etnyre’s own Qduino Mini. 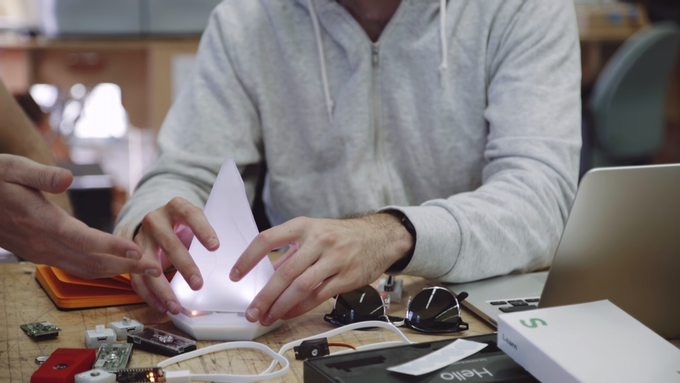 Its creators are also exploring the idea of opening the lamp up so developers and Makers can hack their own projects. We’ll have to wait and see until the end of its crowdfunding campaign! Looking to form a better habit? 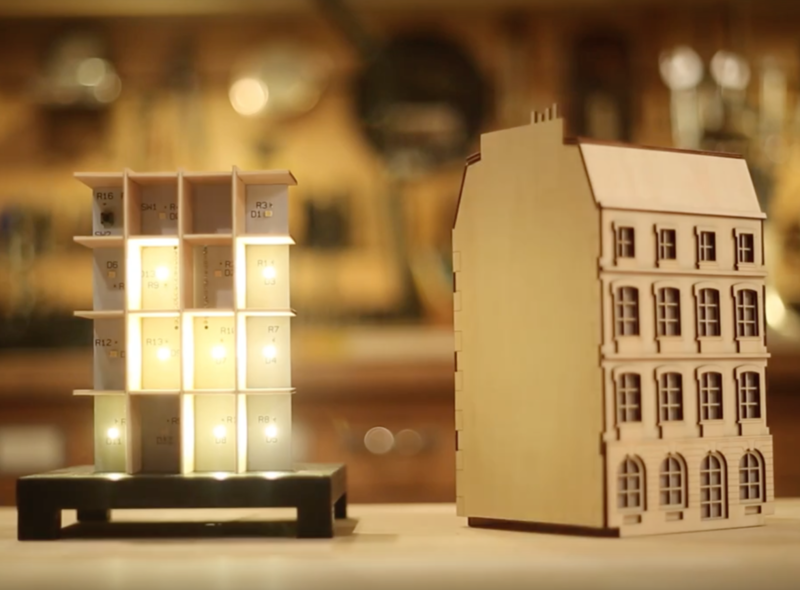 Enjoy mini light shows? Then head over to Peak’s Kickstarter page, where you can learn more about the product, the philosophy and the entire design process.